If the basic sound of jazz is based on tetrad chords (aka four-note chords), it is common to extend them with other tones. 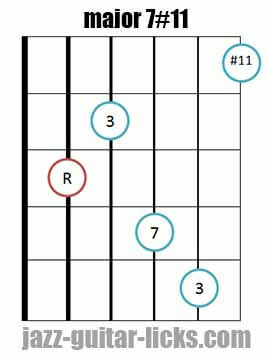 These other notes form the upper structure of a chord which includes 9th, 11th and 13th. Adding extensions to chords help to get off the beaten tracks and provides some new harmonic colors to your playing (chord soloing, comping, and arrangement). 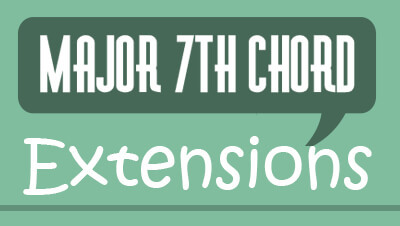 This lesson provides you useful extended major 7th chord shapes to apply to your playing. How are built major seventh chords? Basically, major 7th chords are made up of a root (1), third (3), fifth (5) and seventh (7). They can be extended with a ninth (9), a sharp eleventh (#11) and a thirteenth (13). The notes in yellow in the chart below can be added to the basic structure of a major 7th chord to extend it. Therefore, a C major 7th chord can become Cmaj9, C maj7#11, Cmaj13. The first possibility to extend a major seventh chord is to add the ninth. That gives what we call major 9 chords (Maj9). They are made up of a root (1), a major third (3), a perfect fifth (5), a major seventh (7) and a ninth (9). 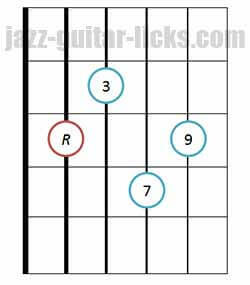 Major 9th chords can be written M9 or maj9. 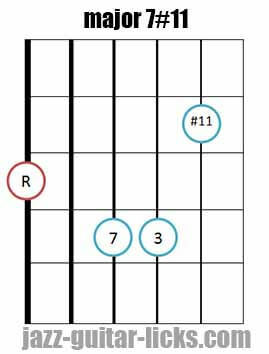 Here are two basic chord shapes to play maj9 chords on the guitar. The first diagram has its root on the sixth string and the second has its root on the fifth string. 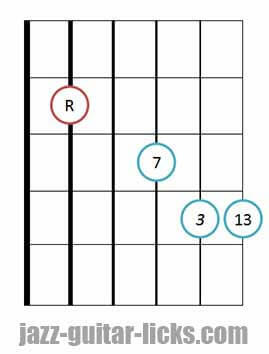 As you can see in these diagrams, the fifth is omitted, because guitarists don't have enough fingers to play the five notes of these chords. 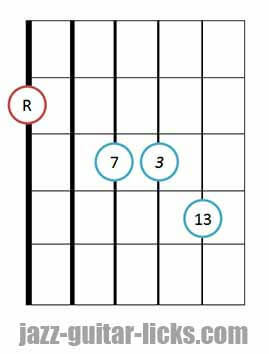 You can visit the page about drop 2 maj9 guitar chords to get more possibilities to play them on the guitar. The second option of major 7th chord extension is to add the sharp eleventh (#11) instead of the fifth (5). The #11 extension can be seen as the fourth (4) sharpened in the higher octave. Major 7#11 chords (major seventh sharp eleventh) can also be named Lydian chord or Lydian augmented chord. Adding the #11 can be very interesting when you want to add modern sounding to your chords in any harmonic context. 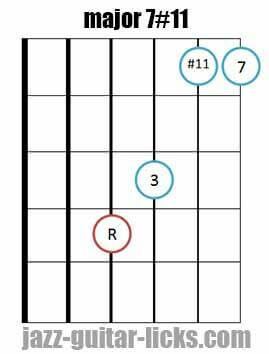 Indeed, this chord can replace chord IV in major keys and even the chord I. 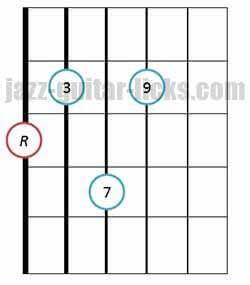 Because of their modern sounding, major7#11 chords have a better place in modern jazz tunes than in classic jazz standards. Major thirteenth chords contain seven tones : root (1), major third (3), perfect fifth (5), major seventh (7), ninth (9), eleventh (11) and thirteenth (13). But since there are only six strings on the guitar, it is physically impossible to play all these tones, 5th, 9ths and 11ths can be left out.